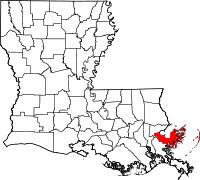 St. Bernard Parish, once boasting a population of over 67,000, currently has about half that due the devastation wrought by Hurricane Katrina in 2005. The parish was named the fastest growing county in the United States from 2007 to 2008, however the population still has yet to approach pre-storm levels. St. Bernard Parish uses a free online records system to allow access to the parish vital records, including marriage records and many others. In addition, the Court Recorder in Chalmette, LA., can be contacted regarding records. The Recorder's office address is 9061 W Judge Perez Dr.
As mentioned, St. Bernard Parish suffered greatly during Hurricane Katrina and was one of the hardest hit parishes with the storm damaging every standing structure in the entire parish and flooding almost the whole area. The parish remained without vital services for several months after the storm, and demolition continued on wrecked buildings for more than a year.